316 Stainless Steel Handrail Support 2 61/64" Dia. x 1 2/3" Dia., Pivotable, for Square Tube 1 9/16" Dia. This INOX Handrail Support for Square Tube has a stainless steel design and features a pivotable movement. 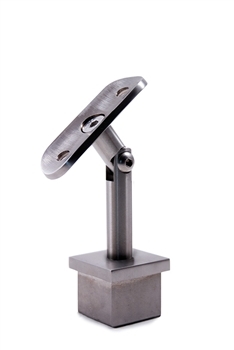 316 Stainless Steel Handrail Support for 1-37/64" Square Tube 316 Stainless Steel Handrail Support for Glass 316 Stainless Steel Handrail Support For Square Tube, for Lateral Fastening, Pivotable 316 Stainless Steel Handrail Support 2 61/64" Dia. x 1 2/3" Dia., for Square Tube 1 3/16" Dia.